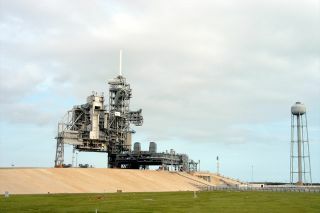 Launch Pad 39A at NASA's Kennedy Space Center in Florida has been opened to the public for tours. The NASA launch pad from which Apollo 11 lifted off for the first manned moon landing and Atlantis left Earth to fly the last space shuttle mission is now open to the public for tours. Launch Pad 39A at the Kennedy Space Center (KSC) in Florida is the latest, limited-time tour stop being offered by the NASA spaceport's visitor complex. The tours — which also include separate trips to KSC's 52-story tall Vehicle Assembly Building (VAB) and the Launch Control Center (LCC) — are now being offered as part of the center's 50th anniversary celebration. "These are very rare opportunities that NASA has worked with us to provide to our visitors from Florida, across the United States and overseas," Bill Moore, chief operating officer of NASA's Kennedy Space Center Visitor Complex, said in a statement. "With exciting new space exploration programs coming to the Kennedy Space Center, we may never have access to such historic places like this again." Pad 39A was one of two large launch complexes built in the 1960s to support the Saturn V launches to the moon, Saturn IB launches to the Skylab space station and space shuttle launches to deploy and service satellites and build the International Space Station. The current downtime between launches has allowed the opportunity for the visitor complex to bring guests closer to the launch pad than ever before. The new "KSC Up-Close: Launch Pad Tour" buses guests from the visitor complex to Pad 39A, following alongside the same river stone-lined "crawlerway" that rockets and shuttles once slowly rumbled across riding atop massive tank-like transporters. Previous bus tours drove this same path but then veered off to circle the security fence that surrounds the launch pad. On the new tour, the guards stationed at the pad will wave the bus forward, permitting the tour to proceed almost a quarter-mile (400 meters) within the pad's perimeter. "Visitors will travel the same route as astronauts to the launch pad, so they can imagine being an astronaut," said Moore. "You can walk in my shoes," retired NASA astronaut Jon McBride said in a statement. "The launch pad is the last place that I was on Earth before reaching the heavens." Near the pad, visitors will be able to exit the bus for photo opportunities, including close-up views of the 350-foot high (107-meter) fixed service structure (FSS), rotating service structure (RSS), propellant and water tanks, flame trench and other aspects of the launch pad complex. The buses will then continue onward for drive-by views of Pad 39B, the Vehicle Assembly Building and the mobile launch platforms that moved between the VAB and pads. The tour culminates at the Apollo/Saturn V Center, where one of three remaining moon rockets is on display. The launch pad tour is offered twice daily and takes about two hours to complete. The tour runs $25 for adults and $19 for children ages 3 to 11, plus tax, in addition to general admission to the KSC visitor complex. The pricing matches tickets for the earlier announced VAB and Launch Control Center tours. The VAB tour, which provides visitors the chance to enter the voluminous buildingwhere Saturn rocket stages were stacked and shuttles were assembled for launch, currently offers guests a limited chance to view the space shuttle Atlantis parked inside one of its high bays. Atlantis is scheduled to be moved on Nov. 2 to the visitor complex for its permanent display. For more about the KSC Up-Close: Launch Pad Tour or to purchase tickets, see the visitor complex's website.